The state vector can be filled with values which are returned by actual sensors. The Transition matrix needs to be set up according to a motion model. Same holds for the control input matrix. But how can I determine w_t and v_t ? 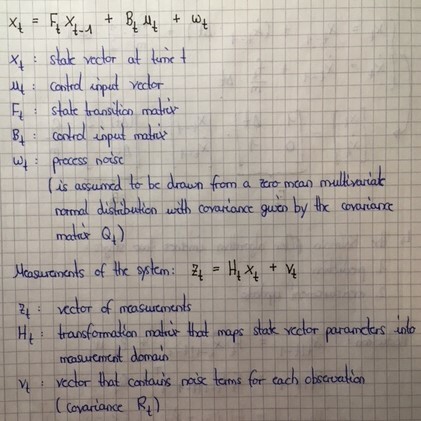 How do I know which values to choose for the covariance matrices Q and R ? All noises are assumed as Gaussian models in KF and EKF. To determine the values for the measurement noise you need to collect a sample data sets from the sensors that you are using. For each data set you can calculate the variance value put it to the corresponding position of the measurement noise covariance matrix. Usually process noise covariances are experimental values. You can use a trial and error method to find the values which reduce the error. Not the answer you're looking for? Browse other questions tagged kalman-filter or ask your own question. How much should I expect a Kalman filter to converge? How do I choose the best filter for dead reckoning with an IMU? How do I go about implementing a Kalman Filter for a pose estimation algorithm? Kalman-Filter: how to solve angles near +/-pi?